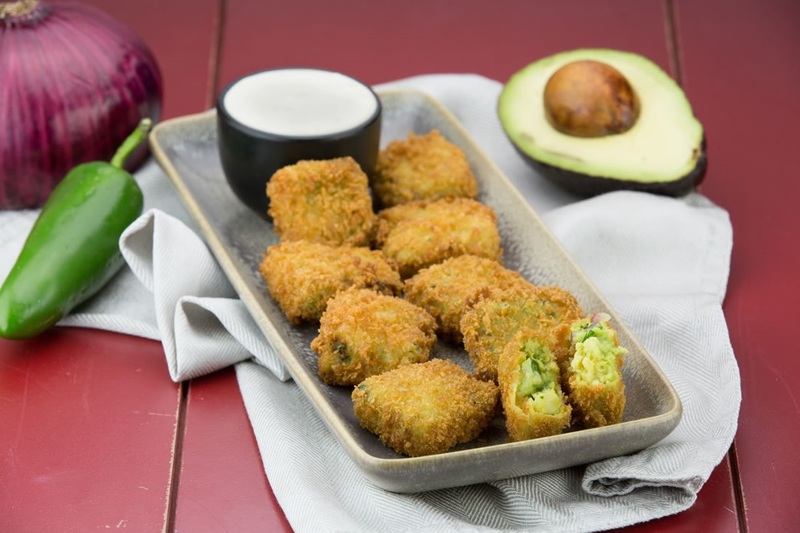 Our fresh Hand Shucked Clams get a Latin twist when mixed into homemade guacamole, breaded, and deep fried, served with ranch dressing. Slice avocados in half, remove pits, and scoop into a bowl, reserving 1 half avocado. Coarsely mash then fold in onion, jalapenos, cilantro, lime zest and juice, salt, pepper, and garlic. Mix in hand-shucked clams and the remaining avocado and spread mixture in an even ½” layer onto a greased parchment paper lined sheet tray, then top with another greased sheet of parchment paper and smooth out the surface. Freeze solid, about 6-8 hours. Mix eggs with 3 tablespoons clam juice. Place avocado mixture on a cutting board and cut into small cubes. Working quickly, coat cubes in flour, dip in egg wash, let excess drip off, then toss in panko bread crumbs. To cook, heat oil in a deep skillet or pot to 350°F and fry bites in batches until golden and drain on paper towels. Serve immediately on a plate topped and serve with a dipping cup of ranch dressing. Sea Watch: DHSC – 12/1 lb.